“My life has fresh meaning”, said Aliva at the teams final meeting. And as our Golden, Golden Oldie, Keith our oldest member at 82 summed up the teams feeling quite succinctly by stating, “this week has been quite remarkable”. 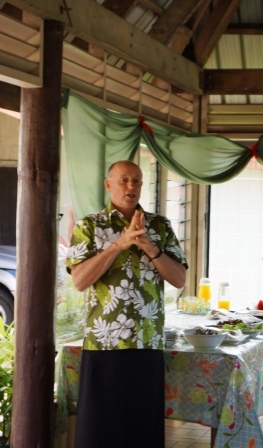 Archbishop Winston for Polynesia, at a farewell at the Bible College prior to the teams departure for the resort said, “I think your Junior Golden Oldie, Andrea, sums up all your reflections, ‘this mission has changed me’ and your coming has in fact changed us all. Now I announce that the Golden Oldies Mission is to be an important part of missions to our Islands going forward into the future”. 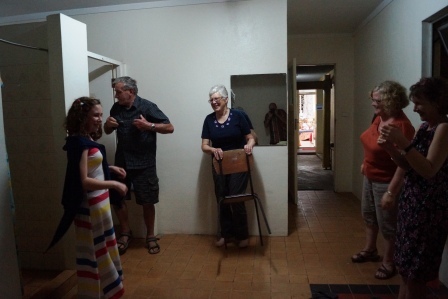 The Golden Oldies were welcomed by villages that had never hosted a ‘white group’ before, dining with squatters that are about to be evicted off their land they have lived on since birth, meeting children at the Church-supported school achieving academically against all odds considering many walk from squatter villages to attend school, to fellowshipping in churches from tin sheds to the decaying oldest church on the island urgently in need of restoration, to communing with the bible college students and their families at the bible college hostel, to relaxing and reflecting on all this experience at a tourist resort. “We must move missions away from handouts to our villages and people. We need to give them training and resources to help them help themselves. Help us buy the fishing rods, teach them how to use them, and not just continue to feed them with fish that doesn’t break this cycle of poverty”. And so the team launched the establishment of the ‘Golden Oldies Mission Development Fund’. 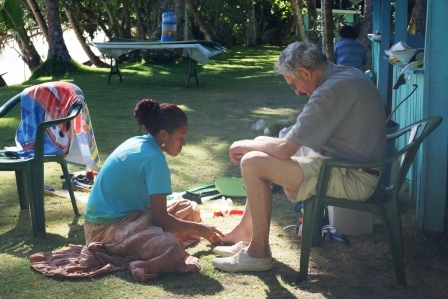 A fund to support people and projects, in partnership with the church, to build the Kingdom of God in Fiji. Funding of Fj$10,000 had already been raised prior to coming on mission, and this money is the first contribution to supporting people and projects identified. 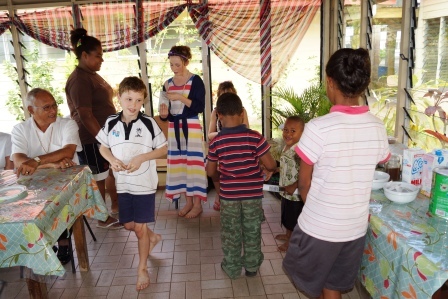 The team from its mission visitations have initially endorsed the following ministries they would like to pursue supporting: education scholarships for students to attend school and/or tertiary training; a vocational building adjacent to Basden College; a toilet block at St John’s Church in the Valley; the Boys Brigade ICONZ programme introduced and adapted to Fijian children/youth; children’s books for the villages and theological books for the Churches/Bible College; a stove for ‘aunty’ at the bible college; and financial support for church staff, like Joe, to provide more developmental assistance to these schools, villages, and churches. One final observation. The poorer the village/church, the greater the generosity of gifts showered upon the team and hospitality offered. Yes it has been a ‘remarkable’ mission. The first ever ‘Golden Oldies Mission,’ and God-willing and with his leading, the beginning of a new chapter in missions, with our wonderful Golden Oldies, recruited as a new wave of foot soldiers returning to the frontline, leading the charge! Even with the best planning, there is always the risk that our Golden Oldies may on occasions need some medical assistance. Having a Registered Nurse, Adele, with us on the team has provided a great comfort to our members. However when visiting remote villages, and a change to normal daily routines this can unintentionally cause some health issues to arise. Yet in each situation we faced, the presence and planning by God was evident. Yes there were a few cases of diarrhoea, insect bites and grazes, but quickly remedied with medical support from Nurse Adele. But when one of our team fainted in the Church at Pacific Harbour, God ‘in advance’ had already planned the seating arrangements! Seated at the back, our member fainted into the arms of Nurse Adele, ‘coincidently’ seated next to him. Then with Principal Amy and her husband George travelling the hour from Suva and joining the team for this service, they ‘coincidently’ had the only vehicle that could provide transport to a local hospital for a medical assessment. Promptly seen by a doctor there he was released and made a rapid recovery. 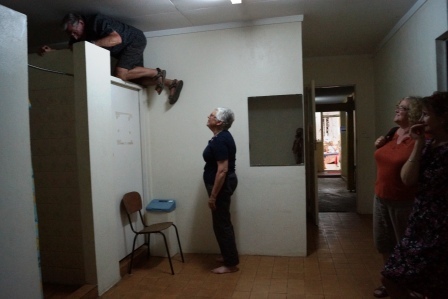 Not to be out done, travelling back to Suva airport to return home, another Golden Oldie had a turn for the worse, again with support from Nurse Adele, and communications with our Fijian support team, we were able to divert to a hospital only 3-minutes away. On arriving within 1-minute our member was being treated by professional and efficient nursing staff. He is making a full recovery, and he and his wife, along with Nurse Adele who stayed to provide any further care needed, will return to NZ later this week. 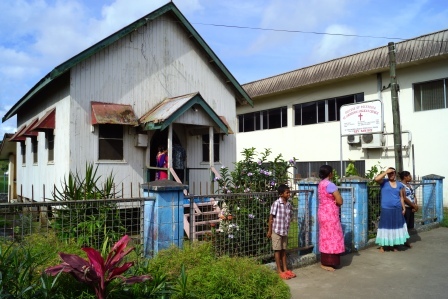 They are recuperating at the Bible College in Suva where the team spent the first part of the mission, receiving VIP care and love from the Christian community there. 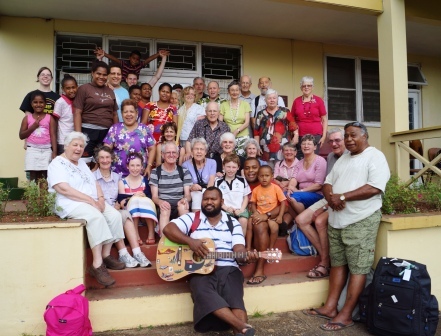 The encouraging aspect is; with our experienced senior nurse Adele, our Fijian team support, the Fijian medical system, and God’s protection and provision every step of the way, our Golden Oldies have been kept in good health. Interestingly, since this Baianarama coup, his priority is quality health for all people, Fijians and visitors, promptly and professionally administered. We saw evidence of this first hand through our two ‘hospitalisations’. In fact Baianarama regularly unannounced, visits medical centres to check their performance. Prior to his leadership this standard of care was unheard of. 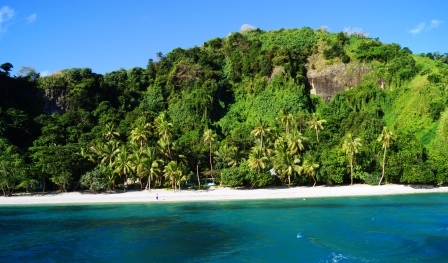 An authentically Fijian Tourist resort, Uprising, at Pacific Harbour, an hour south on the coast was to be the much anticipated ‘holiday part’ of the mission. The Uprising staff, and especially Kelera, treated the Golden Oldies like royalty ensuring their every need was cared for. 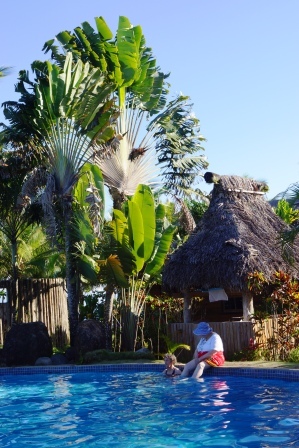 The team enjoyed resting under the palm trees, walking the beach, swimming in the sea and resort pool, exploring the local shops and reading. Mike, Shaa, and the team form ‘Fishing Charter and Pleasure Cruises’ looked after the team as VIP guests, even lifting some onto their launch. Another wonderful day out and the island looked just like those tourist brochures we see, they’re real! 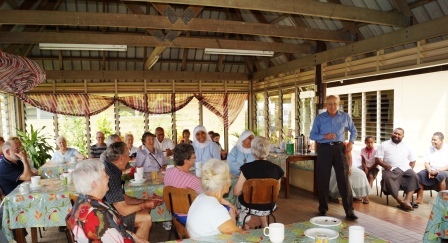 The Golden Oldies were also warmly hosted by the Holy Family Church at Pacific Harbour for a Church service on the Sunday, followed by a Village luncheon afterwards. 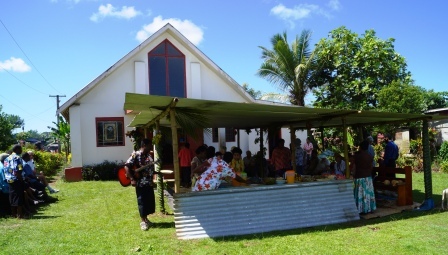 Father Demesi and his people even built a ‘community hall’ outside their church on the lawn for the occasion. 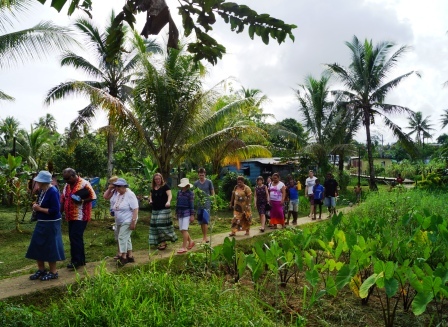 The team finished the Resort time reflecting on the mission and the personal transformation it was bringing to our own personal lives, and how to respond to partnering with the Churches in Fiji going forward. Help! Save Me! I’m locked in the toilet! well until Golden Oldie SUPER Grant was called to rescue the damsel in distress. Yes ‘Junior’ Golden Oldie Andrea went to the loo last night before bed and as she went to unlock the toilet door, the latch jammed shut! With no way to crawl underneath and a tall door that towered above her, she was stuck. Cries of ‘stop sitting on the job’ and ‘well just try harder to turn the latch’, were all in vain. applause and tears of joy from an anxious and frightened mother (well maybe not!). Well done Golden Oldie Super Grant, Andrea’s hero for life! 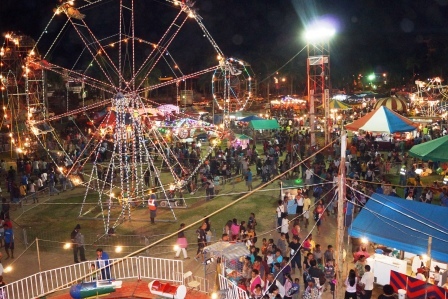 A night off, and with the annual week-long Hibiscus Festival is in full cry at Suva’s main park, the Golden Oldies hit the fair ground. 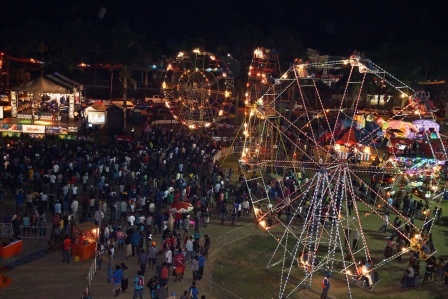 Looking forward to an evening of cultural entertainment on the big stage turned into totally the opposite.With the thousands of excited Fijians, we jostled our way through the stampede into what turned out to be an oversized circus of side shows. Not even a coconut shy, they used dented coke tins! 4 shots for a $1 to knock down the 11! tins. $60 if you can knock them all down with one ball, ummmmm. ground-zero, and then start this horrific manoeuvre all over again. And the best part of the nightmare? Putting your feet back on solid ground. Strange thing though, the ‘Junior’ Golden Oldies enjoyed it!! Next time my $2 will go on the coke tin shy! 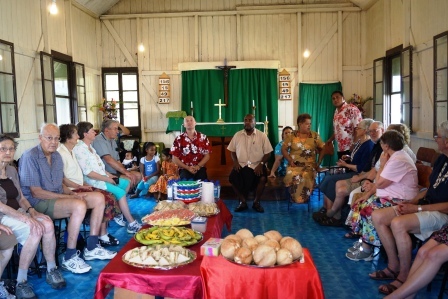 St Lawrence Anglican Church in Nausouri is the first Church built on Viti Levu,1881, and today hosted the first ever Golden Oldies mission group from NZ. Nestled in the main street of a bustling little town and opposite the courthouse, this quaint little church has seen better days. The beautiful architecture and its proud history are fading as this church now sits in disrepair. Its brokenness reflects its physical appearance, but spiritually there is a strong sense of God within its walls and people who worship here. The Golden Oldies were hosted by the parish for a luncheon and their dreams to bring the love of God to this township were expressed with passion and conviction. Sometimes its difficult to explain why you are moved by things, but this tired historical church had something anointed about it. It left its mark on the Golden Oldies as they said their farewells, pondering about how working in partnership they could support the restoration of this once fine church back to its former glory. 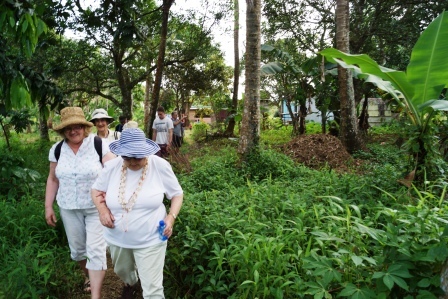 The Golden Oldies unannounced, descend on a squatter village through a plantation jungle track passing similar squatter settlements along the way. 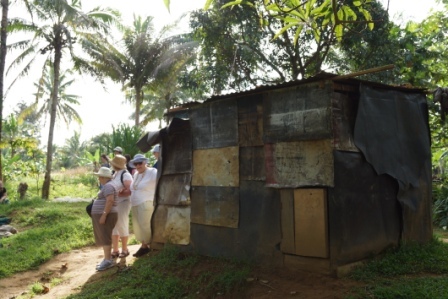 Biscuit tin shacks with mud floors, fire pits against the inner wall, and cloths draped over doorways are the family’s life possessions.Yet on arriving at this remote village with it 10 shacks and 60 people, we are instantaneously welcomed and offered coconuts for refreshments. 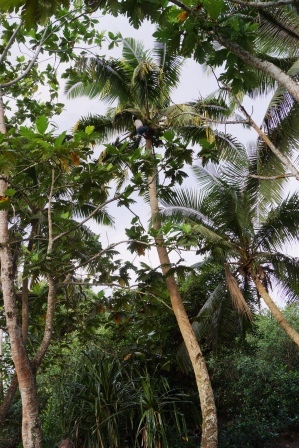 The children climb to the top of the palms, the men slash the tops off them as they fall to the ground, and the fresh cold coconut-lemon flavoured juice is enjoyed by everyone. mangroves to the sea, and return when the tide turns and refills the mangroves by their settlement.The stillness, peaceful surrounds on a warm 25C afternoon with the birds singing in the palms above felt idyllic. The reality is they live there permanently and survival from day to day is their life.